Frantoio Franci was founded in 1958. They are located in Montenero d’Orcia, a small town on the slopes of the Amiata Mountains. The brothers Franco and Fernando Franci purchased the famous Villa Magra olive grove proceeding to transform the old barn into an oil-mill. 1995 was the turning-point for Frantoio Franci. It was the beginning of the collaboration between Fernando, with his lifetime of experience, and his son Giorgio, who brought new energy and modern business skills to the family enterprise. Their goal was to find their place on the international market. However, it was immediately obvious that they didn’t have the economy of scale to compete with the big producers. What they did have was an incredible collection of orchards and the skills to produce Olive Oil with “genuine quality, absolute and with no compromise”. In the end they were pioneers in the burgeoning market for real Extra Virgin Olive Oils. What I find most interesting about Frantoio Franci is that they just don’t produce big EVOOs they have an entire range. There is the Olivastra Seggianese which is a light but flavorful oil from the mountains of Southern Tuscany to one of the few bottles I have had that is actually worth $50 the Villa Magra Grand Cru with its intense yet oh so elegant flavor profile. In between we offer their Biologico which is medium bodied and certified organic and the Villa Magra which is another of their intense offerings. 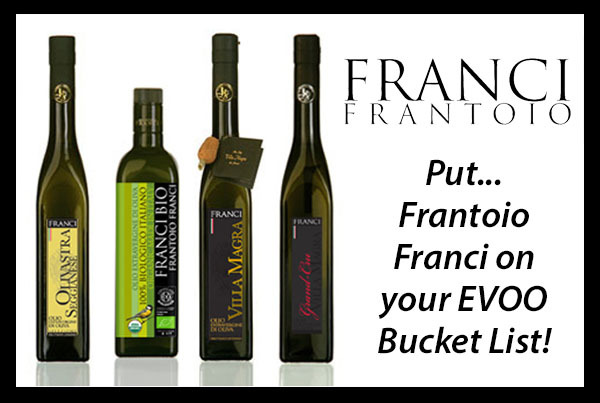 Any list of the benchmark producers of Extra Virgin Olive Oils has to include Franci. They are largely responsible for direction better Olive Oil producers have taken in the 2 or 3 decades. Keep in mind you may assort 3 bottles from the entire selection of our Crossroads4ExtraVirginOliveOil.com site. Very few retailers in North America have EVOOs of this level of quality or a selection this broad at these price points. This is the best place to shop for EVOO on the net! Some of the Videos are not in English but they are informative never the less. Look at them as an opportunity to get a feel for the terroir!